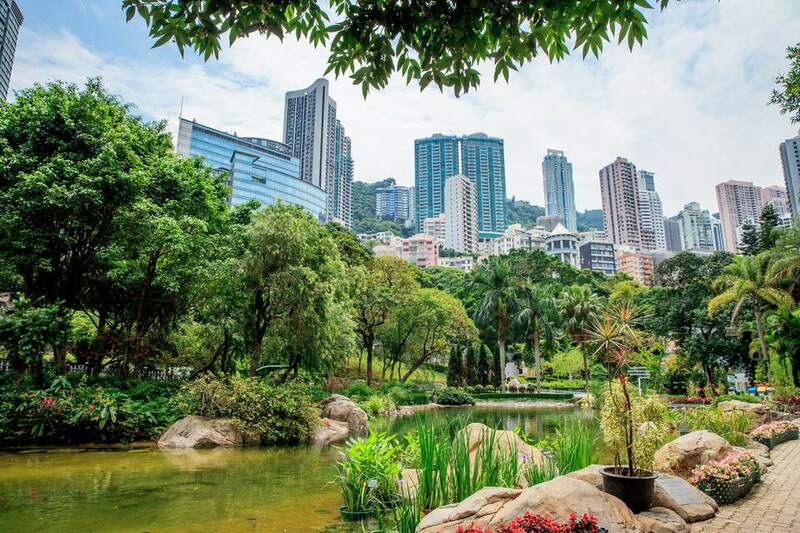 Perched over the skyscrapers of Central Hong Kong, Hong Kong Park is a green slice of peace and quiet in the mayhem of Hong Kong’s urban jungle and a great place to grab a breath of fresh air amongst its landscaped gardens. The park features an aviary, the Hong Kong Teaware Museum and a number of colonial buildings set among intricately designed gardens. To call Hong Kong Park a park is somewhat of a misnomer, as there is absolutely nothing wild about the setting. Those expecting London’s Hyde Park or New York’s Central Park will be disappointed; Hong Kong Park is actually an impeccably groomed parade of trees, flowers, fountains, and ponds but you won’t find a blade of grass to set up your picnic on. There are plenty of benches where you can park yourself and your lunchbox though. The highlight of the park is the artificial lake, which incorporates a number of waterfalls and rock pools and is home to a colony of turtles that spend their days lounging around on the rocks. The park is also fenced in by Hong Kong’s forest of skyscrapers and the slopes of Victoria Peak, making for some great pictures. If you can make it to the park just after dawn, you’ll also find Hong Kong’s legion of Tai Chi followers stretching their limbs as the sun rises. Up until 1979 Hong Kong Park was home to the British Victoria Barracks and there are still a number of colonial buildings left over from its time in the military. By far the finest is Flagstaff House, once the luxurious home for the Commander of British Forces in Hong Kong. The building now houses the Hong Kong Teaware Museum. The Museum has a fine collection of porcelain and tea-related antiques but and also hosts tea tasting sessions. Even if you don’t fancy a cup of chai, this grandiose 19th-century building with its wide verandas and cool columns is well worth a visit. Also set in the park is the Hong Kong Visual Arts Centre, which utilizes a suitably imperious looking former British barrack block. There are a couple of kiosks around the park that sell snack food and drinks, while a full-service restaurant can be found near the lake and waterfall. It's gone through a couple of uninspiring incarnations and its current mishmash of Thai and Japanese food has few fans — although the al fresco dining is attractive. Our tip is to load up on goodies inside the Pacific Place shopping mall just underneath the park. The Great supermarket has a fantastic deli counter where you can pick up both Chinese and Western snacks and meals. Hong Kong Park is at 19 Cotton Tree Drive. It is best reached via the Admiralty MTR using Exit C1. You will walk through Pacific Place shopping mall to reach the park.